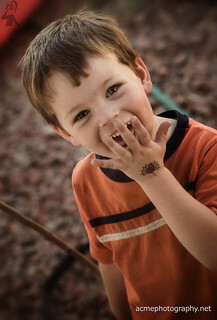 A quick portrait of my son Ansel in the back yard while testing a Nikon D90 camera. Maybe I need to run tests on cameras more often, because it seems that's when I photography my children. Grandma, my sister, mom, etc always ask for photos of our kids but they never buy the excuse that they need to hire me as a photographer to get photos of my kids. :-) FYI, the thing on his hand is a fake tattoo of a spider. © Adam Nollmeyer - All Rights Reserved.